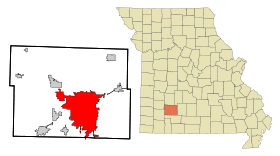 Nickname(s): The "Queen City of the Ozarks" or the "Birthplace of Route 66"
The territory known as Missouri was included in the Louisiana Purchase of 1803. Soon after, the Delaware Native Americans received treaty land where Springfield's Sequiota Park and the antique stores of its Galloway Village stand today. To the west, 500 Kickapoo Native Americans built wickiups on the prairie that still bears their name. 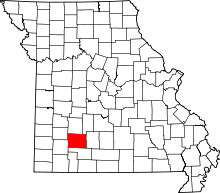 Missouri became a state on August 10, 1821, and in 1833 the legislature designated most of the southern portion as Greene County. The county was named in honor of American Revolutionary War General Nathanael Greene, largely through a campaign, started in 1829, by Springfield's founder, John Polk Campbell, a Tennessee homesteader. Officially, Springfield was founded in 1830, and was incorporated in 1838. The origin of the name, Springfield is unclear, but the most common view is that the city was named for Springfield, Massachusetts. One account holds that James Wilson, who lived in the then unnamed city, offered free whiskey to anyone who would vote for the name Springfield, after his home town of Springfield, Massachusetts. In 1883, the historian R. I. Holcombe wrote, to the contrary: "The town took its name from the circumstance of there being a spring under the hill, on the creek, while on top of the hill, where the principal portion of the town lay, there was a field." He further stated that, "This version of the origin of the name is disputed by the editor of the Springfield Express, Mr. J. G. Newbill, who, in the issue of his paper, November 11, 1881, says, 'It has been stated that this city got its name from the fact of a spring and field being near by just west of town. But such is not a correct version. When the authorized persons met and adopted the title of the "Future Great" of the then Southwest, several of the earliest settlers had handed in their favorite names, among whom was Kindred Rose, who presented the winning name, "Springfield," in honor of his former home town, Springfield, Robertson County, Tennessee.'" Springfield was incorporated in 1838. That same year, Cherokee Native Americans were forcibly removed by the U.S. government from their homelands in Tennessee, Alabama, North Carolina and Georgia to the "Indian Territory." Their route became known as the Trail of Tears due to the thousands of Cherokee deaths on the journey and as a result of the relocation. The Trail of Tears passed through the Springfield area via what is known today as the Old Wire Road. The Trail of Tears National Historic Trail auto tour route is along Interstate 44 westward to US 160 (West By-pass in Springfield) and westward along US 60. The Old Wire Road, then known as the Military Road, served until the mid-1840s as a connection between Springfield and the garrison at Fort Smith, Arkansas. By 1858, the Butterfield Overland Stage began utilizing the road offering passage to California. Two years later, the region's first telegraph line was strung along the road, and it was dubbed the Telegraph or Wire Road. The road proved vital during the Civil War, and its most historic connection is to the Battle of Pea Ridge in Arkansas. While portions of the road exist today, the most easily accessible is within Wilson's Creek National Battlefield. The 1849 charter of the Pacific Railroad, established to construct a line from St. Louis westward across central Missouri, was expanded in 1852 to include a Southwest Branch. However, after defaulting on its obligations, the state seized this branch and sold it, thus creating a new company, the Southwest Pacific Railroad. (The initial line through central Missouri eventually was renamed the Missouri Pacific Railroad). Subsequent defaults led to the line toward Springfield being known as the South Pacific Railroad and the Atlantic & Pacific Railroad, before finally operating under the name St. Louis and San Francisco Railway, more commonly known as the Frisco. Commercial and industrial diversification came with the railroads, and strengthened the City of Springfield and North Springfield when the two towns merged 17 years later in 1887. As railroad construction progressed, Springfield became the crossroads of the Frisco's St. Louis to Tulsa line and the Kansas City to Memphis line, and eventually the Frisco Railroad established its headquarters in Springfield. Today visitors can enjoy the view from the Jefferson Avenue Footbridge, peering below to the locomotive path which is still in use. With the American Civil War imminent and Missouri a border state, Springfield was divided in its sentiments. On August 10, 1861, opposing forces clashed a few miles southwest of Springfield in the Battle of Wilson's Creek, the site of the first major conflict west of the Mississippi River, involving about 5,400 Union troops and 12,000 Confederates. Gen. Nathaniel Lyon was killed, the first Union general to die in combat, and the Confederates were victorious. Union troops fell back to Lebanon, then Rolla, and regrouped. When they returned to Springfield, the Confederates had withdrawn. The First Battle of Springfield, or Zagonyi's Charge, occurred on October 25, 1861. It was the only Union victory that year in southwestern Missouri. The fighting led to increased military activity in Missouri and set the stage for the Battle of Pea Ridge in March 1862, which essentially cemented Union control of the state. For the next year, possession of the city seesawed. Then on January 8, 1863, Confederate forces under Gen. John S. Marmaduke advanced toward the town square and the Second Battle of Springfield ensued. As evening approached, the Confederates withdrew. The next morning, Gen. Marmaduke sent a message to Union forces asking for proper burials for Confederate casualties. The city would stay under Union control until the end of the war. Two years after the war ended, Springfield National Cemetery was created. The dead of both the North and the South were interred there, though separated by a low stone wall (later removed). In 1960, the National Park Service, recognizing the significance of the 1861 battle, designated Wilson's Creek National Battlefield. The 1,750-acre (7.1 km2) battlefield near Republic remains largely unchanged and stands as one of the most historically pristine battle sites in the country. On July 21, 1865, Springfield helped give birth to the Wild West era when the town square was the site of the Wild Bill Hickok–Davis Tutt shootout, a "quick draw" duel between Wild Bill Hickok and Davis Tutt. Two small brass plaques inlaid into the pavement on Park Central Square mark the locations of both Hickok and Tutt during the famous shootout. On April 14, 1906, a mob broke into the town jail, then lynched two black men: Horace Duncan and Fred Coker, for allegedly sexually assaulting Mina Edwards, a white woman. Later they returned to the jail and lynched another black man, Will Allen, accused of murder. The victims were hanged and burned by a mob more than 2,000 strong in the town square. The men were hanged on the town square from the Gottfried Tower which held a replica of the Statue of Liberty. Judge Azariah W. Lincoln called for a grand jury. The proceedings were covered in both the New York and Los Angeles Times. In the immediate aftermath, two commemorative coins were reportedly issued. Evidence suggested that all three men were innocent, including testimony from Duncan's and Coker's employer. The lynching sparked a mass exodus of African-Americans from the area, who still remain a small minority demographic in Springfield. A plaque on the southeast corner of the square serves as reminder. The notorious mobster John Gotti died in Springfield on June 10, 2002, after being transferred from a prison in Marion, Illinois for health reasons. Recognized by convention as the "Birthplace of US Route 66", it was in Springfield on April 30, 1926 that officials first proposed the name of the new Chicago-to-Los Angeles highway. John T. Woodruff of Springfield was elected as the first president of the U.S. Highway 66 Association, organized in Tulsa, Oklahoma in 1927. Its purpose was to get U.S. 66 paved from end to end and to promote tourism on the highway. In 1938, Route 66 became the first completely paved United States Numbered Highway in America — the "Mother Road" — stretching from the Great Lakes to the Pacific Coast. A placard in Park Central Square was dedicated to the city by the Route 66 Association of Missouri, and traces of the Mother Road are still visible in Downtown Springfield along Kearney Street, Glenstone Avenue, College and St. Louis streets and on Missouri 266 to Halltown. The red booths and gleaming chrome in mom-and-pop diners, the stone cottages of tourist courts and the many service stations along this route saw America fall in love with the automobile. Red's Giant Hamburg, said to be the birthplace of the drive-up order window, was located on the route. Springfield is located at 37°11′42″N 93°17′10″W﻿ / ﻿37.19500°N 93.28611°W﻿ / 37.19500; -93.28611 (37.195098, −93.286213), on the Springfield Plateau of the Ozarks. According to the United States Census Bureau, the city has a total area of 82.31 square miles (213.2 square kilometres), of which 81.72 square miles (211.7 square kilometres) is land and 0.59 square miles (1.5 square kilometres) (0.7%) is water. 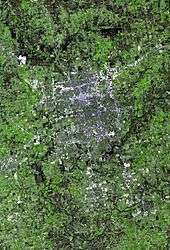 The city of Springfield is mainly flat with rolling hills and cliffs surrounding the south, east, and north sections of the city. Springfield is located on the Springfield Plateau, which reaches from Northwest Arkansas to Central Missouri. The majority of the plateau is characterized by forest, pastures and shrub-scrub habitats. Many streams and tributaries such as the James River, Galloway Creek and Jordan Creek flow within or near the city. Nearby lakes include Table Rock Lake, Stockton Lake, McDaniel Lake, Fellows Lake, and Pomme de Terre Lake. Springfield is near the population center of the United States, about 80 miles (130 km) to the east. Springfield is characterized by four distinct seasons. It experiences an average surface wind velocity comparable to Chicago, Illinois according to information compiled at the National Climatic Data Center at NOAA. It is placed within "Power Class 3" in the Wind Energy Resource Atlas published by a branch of the U.S. Department of Energy; having an average wind speed range of 6.4 to 7.0 miles per hour. Springfield lies in the northern limits of a humid subtropical climate (Cfa), as defined by the Köppen climate classification system. As such, it experiences times of exceptional humidity; especially in late summer. The monthly daily average temperature ranges from 32.6 °F (0.3 °C) in January to 78.2 °F (25.7 °C) in July. On average, there are 39 days of 90 °F (32 °C)+ highs, 2.0 days of 100 °F (38 °C)+ highs, 16 days where the high fails to rise above freezing, and 2.5 nights of lows at or below 0 °F (−18 °C) per year. It has an average annual precipitation of 45.6 inches (1,160 mm), including an average 17.0 inches (43 cm) of snow. Extremes in temperature range from −29 °F (−34 °C) on February 12, 1899 up to 113 °F (45 °C) on July 14, 1954. According to a 2007 story in Forbes magazine's list of "America's Wildest Weather Cities" and the Weather Variety Index, Springfield is the city with the most varied weather in the United States. This can be confirmed by the thousands of citizens living there who experience extreme temperature changes just overnight. In May 2013, Springfield experienced a day that started out humid with a high temperature in the 70s, and by 3 pm there was a thin layer of snow covering the ground. As of the census of 2010, there were 159,498 people, 69,754 households, and 35,453 families residing in the city. 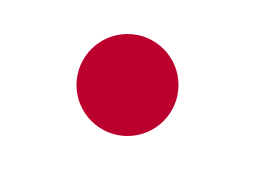 The population density was 1,951.8 inhabitants per square mile (753.6/km2). There were 77,620 housing units at an average density of 949.8 per square mile (366.7/km2). The racial makeup of the city was 88.7% White, 4.1% African American, 0.8% Native American, 1.9% Asian, 0.2% Pacific Islander, 1.2% from other races, and 3.2% from two or more races. 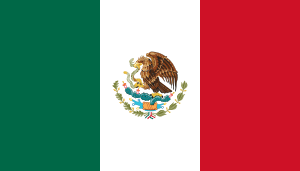 Hispanic or Latino of any race were 3.7% of the population. There were 69,754 households of which 23.4% had children under the age of 18 living with them, 34.4% were married couples living together, 11.8% had a female householder with no husband present, 4.7% had a male householder with no wife present, and 49.2% were non-families. 37.3% of all households were made up of individuals and 11.8% had someone living alone who was 65 years of age or older. The average household size was 2.13 and the average family size was 2.81. The median age in the city was 33.2 years. 18.3% of residents were under the age of 18; 18.4% were between the ages of 18 and 24; 26% were from 25 to 44; 22.7% were from 45 to 64; and 14.5% were 65 years of age or older. The gender makeup of the city was 48.5% male and 51.5% female. According to the 2000 United States Census, 151,580 people, 64,691 households, and 35,709 families resided in the city. The population density was 2,072.0 people per square mile (800.0/km2). There were 69,650 housing units at an average density of 952.1/mi2 (367.6/km2). The racial makeup of the city was 91.69% White, 3.27% African American, 0.75% Native American, 1.36% Asian, 0.09% Pacific Islander, 0.88% from other races, and 1.95% from two or more races. Hispanic or Latino of any race were 2.31% of the population. There were 64,691 households out of which 24.0% had children under the age of 18 living with them, 40.7% were married couples living together, 10.9% had a female householder with no husband present, and 44.8% were non-families. 35.3% of all households were made up of individuals and 11.6% had someone living alone who was 65 years of age or older. The average household size was 2.17 and the average family size was 2.82. In the city 19.9% were under the age of 18, 17.4% from 18 to 24, 28.0% from 25 to 44, 19.8% from 45 to 64, and 14.9% were 65 years of age or older. The median age was 34 years. For every 100 females there were 92.9 males. For every 100 females age 18 and over, there were 90.0 males. The median income for a household in the city was $29,563, and the median income for a family was $38,114. Males had a median income of $27,778 versus $20,980 for females. The per capita income for the city was $17,711. About 9.9% of families and 15.9% of the population were below the poverty line, including 19.1% of those under age 18 and 7.9% of those age 65 or over. Springfield's economy is based on health care, manufacturing, retail, education, and tourism. With a Gross Metropolitan Product of $13.66 billion in 2004, Springfield's economy makes up 6.7% of the Gross State Product of Missouri. Total retail sales exceed $4.1 billion annually in Springfield and $5.8 billion in the Springfield MSA. Its largest shopping mall is Battlefield Mall. According to the Springfield Convention & Visitors Bureau, an estimated 3,000,000 overnight visitors and day-trippers annually visit the city. The city has more than 60 lodging facilities and 6,000 hotel rooms. The Convention & Visitors Bureau spends more than $1,000,000 annually marketing the city as a travel destination. 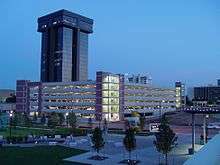 Positronic, Bass Pro Shops, John Q. Hammons Hotels & Resorts, BKD, Noble & Associates, Prime, Inc., Springfield ReManufacturing, and O'Reilly Auto Parts have their national headquarters in Springfield. In addition, two major American Christian denominations—General Council of the Assemblies of God in the United States of America (one of the largest of the Pentecostal denominations) and Baptist Bible Fellowship International (a fundamentalist Baptist denomination with roots to J. Frank Norris)—are headquartered in the city as well. Springfield city government is based on the council-manager system. By charter, the city has eight council members, each elected for a four-year term on a non-partisan basis, and a mayor elected for a two-year term. The mayor is Robert Stephens, who was sworn in after the resignation of Mayor Jim O'Neal (term expires 2013). Council members include Jeff Seiferd (Zone 1), Cindy Rushefsky (Zone 2), Jerry Compton (Zone 3), Craig Fishel (Zone 4), Jan Fisk (General A), Craig Hosmer (General B), Doug Burlison (General C) and Mike Carrol (General D). Greg Burris, the city manager, appointed by the council to be the city's chief executive and administrative officer, enforces the laws as required by the city charter. The presiding officer at council meetings is the mayor. Council meetings are held every other Monday night in City Council Chambers. City council elections are held the first Tuesday in April. City Utilities of Springfield (CU) is a city-owned utility serving the Springfield area with electricity, natural gas, water, telecommunications and transit services. CU provides service to over 106,000 customers. The Springfield Public School District is the largest district in the state of Missouri with an official fall 2011 enrollment of 24,366 students attending 50 schools. Public high schools include Central High School, Kickapoo High School, Hillcrest High School, Parkview High School, and Glendale High School. Private high schools include Springfield Sudbury School, Summit Preparatory School, Greenwood Laboratory School, New Covenant Academy, Springfield Lutheran School, Springfield Catholic High School, Christian Schools of Springfield, and Grace Classical Academy. Springfield has several colleges and universities within the city. Founded in 1905 as the Fourth District Normal School, Missouri State University (MSU) is the state's second largest university with just over 20,000 students. For the seventh consecutive year, MSU has been selected for The Princeton Review's 2010 list of "Best Colleges: Region by Region." Drury University is a private university with nearly 5,000 students and consistently ranks in U.S. News & World Report's Top 10 Universities in the Midwest. Ozarks Technical Community College (OTC) is the second largest college in the city of Springfield, having more than 15,000 students in attendance. MSU, Drury, and OTC are all located in and around downtown Springfield. Other colleges in Springfield include Baptist Bible College, Evangel University and Assemblies of God Theological Seminary, and Cox College (Nursing and Allied Health). Branch campuses in Springfield include Mercy College of Nursing and Health Sciences of Southwest Baptist University, Everest College, Columbia College, Webster University, and University of Phoenix. In 2013, a consolidation of Central Bible College, the Assemblies of God Theological Seminary, and Evangel University occurred and is now known as Evangel University. There are 92 parks in the city of Springfield, including the Botanical Center at Nathanael Greene/Close Memorial Park, 3 golf courses, a zoo, and other facilities owned or managed by the Springfield-Greene County Park Board. Its programs, such as Hearts 'n Parks, encourage people to enjoy a more active lifestyle. The department incorporates a network of parks and trails that run near and around geologically unique areas of the Ozarks, such as creek beds and springs. A 35-mile crushed gravel trail, the Frisco Highline Trail, connects Springfield to the town of Bolivar and is particularly popular with mountain bikers. Local recreational facilities have been host to state, local and national tournaments in softball, soccer, hockey, and tennis. The Mediacom Ice Center located in Springfield also has figure skating and hockey programs. Located on the outskirts of town, the Missouri Department of Conservation's Springfield Nature Center as well as Wilson's Creek National Battlefield are good places to take a short hike and enjoy nature. Six recreational lakes are within 100 miles (160 km) of Springfield. The nearby James and Finley rivers provide opportunity for fishing and canoeing, and for those who enjoy hiking, horseback riding, or wilderness camping, the 2,500-acre Busiek State Forest lies just 20 miles to the south. Table Rock Lake and the Branson entertainment area are within 45 miles (72 km). Many residents travel to the Buffalo National River, 110 miles to the south and to the Ozark National Scenic Riverways, 125 miles to the east, for outstanding canoeing on crystal clear streams and hiking. Many other area streams offer excellent canoeing as well as fishing opportunities. The area affords excellent hunting for whitetail deer and turkey as well. Springfield plays host to college teams from Missouri State University (NCAA Division I-Football Championship Series), Drury University (NCAA Division II), Evangel University (NAIA) and few minor professional teams (see below). Springfield is also home to a number of amateur sporting events. The PGA sponsored Price Cutter Charity Championship is played at Highland Springs Country Club on the southeast side of Springfield. The Missouri Sports Hall of Fame is located near the city as well. JQH Arena, which opened in 2009, is home to the Missouri State University Bears and Lady Bears basketball teams, and O'Reilly Family Events Center, which opened fall 2010, is now the new home to the Drury University Panthers men's and women's basketball teams. Springfield Rugby Football Club (SRFC) was established in 1983 and is a well-known club in the sport of Rugby in the Midwestern United States. The Club currently plays in Division III of the Frontier Region of the Western Conference and runs teams for men, women and youth of the area. Like many cities across the nation, Springfield has seen a resurgence in its downtown area. Many of the older buildings have been, and are continuing to be, renovated into mixed-use buildings such as lofts, office space, restaurants, coffee shops, bars, boutiques, and music venues. Located within the Downtown Springfield CID (Community Improvement District) are historic theaters that have been restored to their original state, including the Gillioz Theatre and the Landers Theatre. In 2001, Phase I of Jordan Valley Park opened along with the Mediacom Ice Park. Phase II of Jordan Valley Park will be complete in late 2011 or early 2012. 2001 also saw the opening of The Creamery Arts Center, a city-owned building inside Jordan Valley Park. It is home to the Springfield Regional Arts Council, Springfield Regional Opera, Springfield Ballet, and the Springfield Symphony Orchestra and provides office and meeting space for other arts organizations which serve the community. The center has been recently renovated to include two art galleries with monthly exhibitions, an Arts Library, rehearsal studios, and classrooms offering art workshops and hands-on activities. The facilities also include an outdoor classroom. A March 2009 New York Times article described the history and ascendancy of cashew chicken in Springfield, where local variations of the popular Chinese dish are ubiquitous. There are several arts events that occur annually including the Walnut Street Arts Fest and the Missouri Literary Festival. Also the First Friday Art Walk occurs the first Friday of every month. Formerly, Springfield hosted a fan convention around February every year, known as Visioncon. Since 2013, however, the convention has been held in Branson. Springfield has also seen increased interest in the local and organic food movement and is home to five farmer's markets, a community garden, several natural food stores, a fair trade chocolate factory, a winery, and three craft breweries. During the 1950s, Springfield ranked third in the U.S. for originating network television programs behind New York and Hollywood. Four nationally-broadcast television series originated from the city between 1955 and 1961: Ozark Jubilee and its spin-off, Five Star Jubilee; Talent Varieties; and The Eddy Arnold Show. All were carried live by ABC except for Five Star Jubilee on NBC; and were produced by Springfield's Crossroads TV Productions owned by Ralph D. Foster. Many of the biggest names in country music frequently visited or lived in Springfield at the time. City officials estimated the programs meant about 2,000 weekly visitors and "over $1,000,000 in fresh income." Staged at the Jewell Theatre (demolished in 1961), Ozark Jubilee was the first national country music TV show to feature top stars and attract a significant viewership. Five Star Jubilee, produced from the Landers Theatre, was the first network color television series to originate outside of New York City or Hollywood. Ironically, Springfield's NBC affiliate, KYTV-TV (which helped produce the program), was not equipped to broadcast in color and aired the show in black-and-white. The ABC, NBC and Mutual radio networks also all carried country music shows nationally from Springfield during the decade, including KWTO'S Korn's-A-Krackin' (Mutual). Country music legend Conway Twitty died suddenly in Springfield after a show in Branson. The Springfield Chamber of Commerce once presented visiting dignitaries with an "Ozark Hillbilly Medallion" and a certificate proclaiming the honoree a "hillbilly of the Ozarks." On June 7, 1953, U.S. President Harry Truman received the medallion after a breakfast speech at the Shrine Mosque for a reunion of the 35th Division. Other recipients included US Army generals Omar Bradley and Matthew Ridgway, US Rep. Dewey Short, J. C. Penney, Johnny Olson, Ralph Story and disc jockey Nelson King. 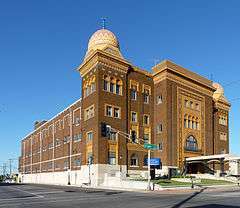 For a complete list, see National Register of Historic Places in Springfield, Missouri. Springfield is served by Interstate 44 which connects the city with St. Louis and Tulsa, Oklahoma. Route 13 (Kansas Expressway) carries traffic north towards Kansas City. U.S. Route 60, U.S. Route 65, and U.S. Route 160 pass through the city. Major streets include Glenstone Avenue, Sunshine Street (Missouri Route 413), National Avenue, Division Street, Campbell Avenue, Kansas Expressway, Battlefield Road, Republic Road, West Bypass, Chestnut Expressway and Kearney Street. Springfield is also the site of the first diverging diamond interchange within the United States, located at the intersection of I-44 and MO-13 (Kansas Expressway) (at 37°15′01″N 93°18′39″W﻿ / ﻿37.2503°N 93.3107°W﻿ / 37.2503; -93.3107﻿ (Springfield, Missouri diverging diamond interchange)). Formerly U.S. Route 66 and U.S. Route 166 passed through Springfield, and sections of historic US 66 can still be seen in the city. US 166's eastern terminus was once located in the northeast section of the city, and US 60 originally ended (westbound) in downtown Springfield. US 60 now goes through town on James River Freeway. In mid-November 2013, the city began discussing plans to upgrade sections of Schoolcraft Freeway(Highway 65) and James River Freeway(Highway 60) through the city to Interstate 244. These plans are currently being discussed and the main reason is to minimize confusion should there be an incident on I-44 as a detour route. Springfield-Branson National Airport (SGF) serves the city with direct flights to 10 cities with multiple daily flights. It is the principal air gateway to the Springfield region. The Downtown Airport is also a public use airport located near downtown. In May 2009, the Springfield-Branson airport opened its new passenger terminal. Financing included $97 million in revenue bonds issued by the airport and $20 million of discretionary federal aviation funds, with no city taxes used. The new building includes 275,000 square feet (25,500 m2), 10 gates (expandable to 60) and 1,826 parking spaces. Direct connections from Springfield are available to Atlanta, Chicago, Dallas, Denver, Ft. Myers, Las Vegas, Los Angeles, Orlando, Phoenix and Tampa. No international flights currently have regular service into Springfield-Branson, but it does serve international charters. Passenger trains have not served Springfield since 1967, but more than 65 freight trains travel to, from, and through the city each day. Springfield was once home to the headquarters and main shops of the St. Louis-San Francisco Railroad (Frisco). The Frisco was absorbed by the Burlington Northern (BN) in 1980, and in 1994 the BN merged with the Santa Fe, creating the current Burlington Northern Santa Fe (BNSF) Railway. BNSF has three switch yards (two small) in Springfield. Mainlines to and from Kansas City, St. Louis, Memphis and Tulsa converge at the railroad's yard facility in the north part of the city. In October 2006, BNSF announced plans to upgrade its Tulsa and Memphis mainlines into Springfield to handle an additional four to six daily intermodal freight trains between the West Coast and the Southeast. The Missouri and Northern Arkansas Railroad also operates several miles of (former Missouri Pacific) industrial trackage within the city. Springfield is a regional medical center with six hospitals and more than 2,200 beds. The city's health care system offers every specialty listed by the American Medical Association. Two of the top 100 hospitals in the U.S. (CoxHealth and Mercy Health System) are located in Springfield, and both are in the midst of expansion projects. The industry employs 30,000 people throughout the Springfield metro area. The United States Medical Center for Federal Prisoners, one of six federal institutions designed to handle the medical concerns of federal inmates, is located at the corner of W. Sunshine Street and Kansas Expressway. In 2008, America's Promise Alliance ranked Springfield among its "100 Best Communities for Young People" for the third year in a row, and on June 11, 2009 Next Generation Consulting ranked Springfield 17th on its "Next Cities" list. 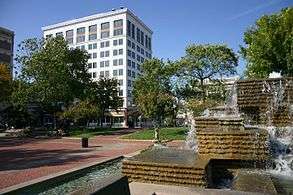 In 2008 Best Life ranked Springfield the 10th worst city in the nation in which to raise a family using information from the U.S. Census Bureau, National Center for Education Statistics, FBI, American Alliance of Museums, National Center for Health Statistics, and American Bar Association. In 2007, The Milken Institute ranked Springfield as a "Best Performing City" for creating and sustaining jobs, and Expansion Management magazine listed Springfield among "Top 20 Mid-Sized Metros for Recruitment and Attraction." Also that year, the World Health Organization designated Springfield as a "Safe Community"; and in 2008, Worldwide ERC named Springfield among "The Best Cities for Relocating Families." According to the Springfield News-Leader, the city has been ranked the second-least diverse city in the United States. The city's major daily newspaper is the Springfield News-Leader. Additional newspapers for Springfield include Daily Events (daily), Community Free Press (bi-weekly), Springfield Business Journal (weekly), The Standard (weekly), and TAG Magazine - tagsgf.com (monthly). Television stations broadcast in Springfield include KYTV (NBC/Weather), KSPR (ABC), KCZ-TV (CW), KOLR (CBS), KOZK (PBS/Create/OPT), KRBK (FOX/MeTV), KOZL (independent, MyNetworkTV), KWBM (Daystar), KRFT (Mundo/TNN/RETRO TV). The Springfield Designated Market Area (SPR-DMA) is the 75th largest in the United States. The area is composed of 31 counties in southwest Missouri and Arkansas. There are 423,010 television-owning households. ↑ Official records for Springfield were kept at downtown from January 1888 to December 1939, Downtown Airport from January 1940 to July 1940, and at Springfield–Branson National Airport since August 1940. For more information, see ThreadEx. ↑ "Robert Stephens". Libertarian Party. Retrieved 2014-09-09. 1 2 "US Gazetteer files 2010". United States Census Bureau. Retrieved 2012-07-08. 1 2 "American FactFinder". United States Census Bureau. Retrieved 2012-07-08. 1 2 "Annual Estimates of the Resident Population: April 1, 2010 to July 1, 2015". United States Census Bureau. Retrieved June 16, 2016. ↑ Dark, Phyllis & Harris. Springfield of the Ozarks: An Illustrated History. Windsor Publications, 1981. ISBN 0-89781-028-7. ↑ "Ozarks Afro-American History Museum Online | Springfield: April 14, 1906 · Lynchings and Exodus". oaahm.omeka.net. Retrieved 2016-10-31. ↑ "Historic Joplin » Blog Archive » 105th Anniversary of Springfield's "Easter Offering"". www.historicjoplin.org. Retrieved 2016-10-31. ↑ Raab, Selwyn (2002-06-11). "John Gotti Dies in Prison at 61; Mafia Boss Relished the Spotlight". The New York Times. ISSN 0362-4331. Retrieved 2016-10-31. ↑ "preservation issues: Route 66 Celebrates 66th!" (PDF). dnr.mo.gov. 1992-05-06. Retrieved 2010-07-30. ↑ "Missouri Breeding Bird Atlas 1986 - 1992: The Natural Divisions of Missouri". Mdc.mo.gov. Retrieved 2010-10-21. ↑ "Wind - Average Wind Speed - (MPH)". NCDC - NOAA. 2002. Retrieved 15 March 2011. ↑ "Wind Energy Resource Atlas of the United States". RREDC - NREL. 1986. Retrieved 15 March 2011. ↑ "Average Relative Humidity(%)". NCDC - NOAA. 2001. Retrieved 15 March 2011. 1 2 "NowData - NOAA Online Weather Data". National Oceanic and Atmospheric Administration. Retrieved 2016-09-07. ↑ Van Riper, Tom (2007-07-20). "In Pictures: America's Wildest Weather Cities: No. 9: Most Variety (biggest variations in temperature, precipitation, wind), Springfield, Mo.". Forbes. Archived from the original on 2016-03-10. ↑ Haugland, Matt (1998). "Cities with most weather variety". Weather Pages. Retrieved 15 March 2011. ↑ "Station Name: MO SPRINGFIELD". National Oceanic and Atmospheric Administration. Retrieved 2016-09-07. ↑ "WMO Climate Normals for SPRINGFIELD/REGIONAL AP MO 1961–1990". National Oceanic and Atmospheric Administration. Retrieved 2014-03-11. ↑ United States Census Bureau. "Census of Population and Housing". Retrieved July 10, 2013. ↑ "Our Community". Coxhealth.com. 2006-09-30. Retrieved 2010-06-08. ↑ "The Role of Metro Areas in the U.S. Economy" (PDF). U.S. Conference of Mayors. March 2006. p. 119. Retrieved 2009-12-26. ↑ "Springfield Business Development Corporation". Business4springfield.com. Retrieved 2010-06-08. ↑ New-Leader Staff (2011-12-14). "Springfield now largest Missouri school district". Springfield News-Leader. ↑ "History of the University". 6 December 2006. Retrieved 2006-12-18. ↑ Miller, Mark (2010-09-28). "Drury University's fall 2010 census reveals record enrollment". Drury.edu. ↑ "Drury University: Quick Stats". Drury.edu. Retrieved 2010-06-08. ↑ "New students, new spaces at OTC this fall". Otc.edu. Retrieved 2010-06-08. ↑ "MCPF Springfield." Federal Bureau of Prisons. Retrieved on May 20, 2010. ↑ "Americas Promise Alliance - 100 Best Communities Past Winners". Americaspromise.org. Retrieved 2010-06-08. ↑ "Ranks Hotspots for Young Professionals to Live and Work in the U.S.". Next Generation Consulting. 2009-06-11. Retrieved 2010-06-08. ↑ "IndustryWeek - Leadership In Manufacturing" (PDF). Expansion Management. Retrieved 2010-06-08. ↑ "WHO Collaborating Centre on Community Safety Promotion". Phs.ki.se. 2008-06-13. Retrieved 2010-06-08. ↑ "Best Cities for Relocating Families" (PDF). Worldwide Employee Relocation Council. 2008. Retrieved 2010-10-21. 1 2 "Interactive City Directory". Sister Cities International. Retrieved 11 March 2014. McIntyre, Stephen L., ed. Springfield's Urban Histories: Essays on the Queen City of the Missouri Ozarks (Springfield: Moon City Press, 2012) 352 pp. Wikimedia Commons has media related to Springfield, Missouri. Wikivoyage has a travel guide for Springfield (Missouri). Wikisource has the text of an 1879 American Cyclopædia article about Springfield.